Kazemi, Elham, Khojasteh Ghamari, Mohammad Amin, Neshanifam, Shokuh. (1395). The Application of Nanotechnology against Humidity in the Building Preservation of Tabriz Historical and Traditional City, Case Study: Blue Mosque, Tabriz. معماری و شهرسازی آرمان شهر, 9(16), 29-38. Elham Kazemi; Mohammad Amin Khojasteh Ghamari; Shokuh Neshanifam. "The Application of Nanotechnology against Humidity in the Building Preservation of Tabriz Historical and Traditional City, Case Study: Blue Mosque, Tabriz". معماری و شهرسازی آرمان شهر, 9, 16, 1395, 29-38. Kazemi, Elham, Khojasteh Ghamari, Mohammad Amin, Neshanifam, Shokuh. (1395). 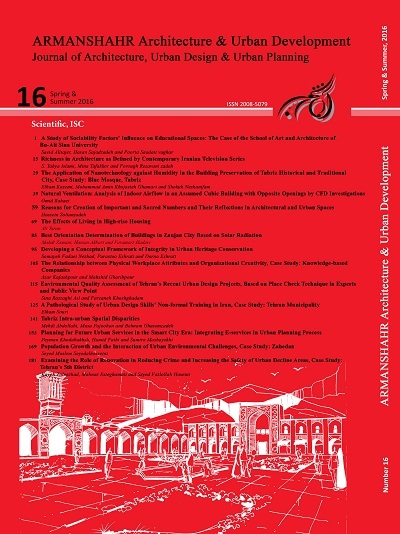 'The Application of Nanotechnology against Humidity in the Building Preservation of Tabriz Historical and Traditional City, Case Study: Blue Mosque, Tabriz', معماری و شهرسازی آرمان شهر, 9(16), pp. 29-38. Kazemi, Elham, Khojasteh Ghamari, Mohammad Amin, Neshanifam, Shokuh. The Application of Nanotechnology against Humidity in the Building Preservation of Tabriz Historical and Traditional City, Case Study: Blue Mosque, Tabriz. معماری و شهرسازی آرمان شهر, 1395; 9(16): 29-38. 1M.A. of Architecture, Department of Architecture and Art Young Researchers and Elite Club, Tabriz Branch Islamic Azad University, Tabriz, Iran. 2Ph.D student of Architecture, Department of Architecture and Art Young Researchers and Elite Club, Tabriz Branch Islamic Azad University and Faculty Member of the Department of Architecture, Institute of Higher Education Roshdiyeh, Tabriz, Iran. Since historical monuments carry national values and identity, their maintenance and protection is necessary through methods which provide holistic stability and originality preservation. Nanotechnology creates the possibility of monitoring the intrinsic traits such as melting temperature, magnetic properties, and load capacity. The colour of materials could even satay changeless in their chemical composition by developing some structures in Nano-meter scale. This means that fewer materials with better quality will be required for a determined function. In this research, it is tried to present solutions for removing deficiencies and damages of historical monuments by application of nanotechnology. Humidity is the main cause of historical monuments damages. Although current insulators prevent penetration of humidity, but they remove adobe and stone surfaces respiration and cause new problems. In this research, it has been tried to provide building respiration by application of nanotechnology and insulators produced by this technology. Religious monument of Blue Mosque is one of the valuable phenomena that relate to the period of Garagounlu. The outstanding feature and publicity of this mosque relies on wonderful and combinatory architecture and mosaic and combination of adobe and tile and solid motives that ornamented the monument interior and exterior surfaces. By selection of case study of Tabriz Blue Mosque, it was tried to investigate nanotechnology performance in this monument based on the region climate and used materials. The research will then present solutions for sections damaged by natural disasters through author laboratory analyses and descriptive and analytical methodologies to preserve this valuable monument in Tabriz architecture history. Anous, I. (2014). Nanomaterials and Their Applications in Interior Design, American International Journal of Research in Humanities, Arts and Social Sciences, 7(1), 16-17. Dabbousi, B. O., Rodriguez-Viejo, J., Mikulec, F. V., Heine , J. R., Mattoussi, H., Ober, R., Jensen, K. F. , Bawendi, M. G. (1997). (CdSe)ZnS Core−Shell Quantum Dots: Synthesis and Characterization of a Size Series of Highly Luminescent Nanocrystallites, Journal of Physical Chemistry, B, 101, 9463. Espargham, F., & Falah Amini, N. (2011). Nano-Technology in Insulation Brick and Stone Buildings Historic, levels, National Congress Building, Way, Architecture. Golabchi, M. (2012). Innovation in Architecture and Engineering Construction, Tehran University Press. Jim, K. (2007). New Particle Explains Odd Behaviour in Cuprite Superconductors, Physical Sciences Editor, The University of Illinois at Urbana-Champaign, 244-1073. Leydecker, S. (2008). Nano Materials in Architecture, Interior Architecture and Design, BirkhauserVerlag AG, Berlin. Liufu, SC., Xiao, HN., Li, YP. (2005). Adsorption of Cationic Polyelectrolyte at the Solid/liquid Interface and Dispersion of Nanosized Silica in Water, J Coll Interface Sci, (285), 33- 40. Maged Fouad, E. (2008). Nanotechnology and Architecture, Master Thesis, Faculty of Engineering, University of Alexandria. Mohamed Hazem, M. F. (2010). Nanomaterials & Architecture “Sustainable Nanoarchitecture”, Master thesis, faculty of Engineering, University of Alexandria. Shagagi, S. (1999). The Relationship between Sustainable Development and Design of the Buildings Climate Cold and Dry, Environmental Science and Technology, 3, 106-113. Singh, M. (2010). Nanoparticles: a New Technology with Wide Application. Research Journal of Nanoscience and Nanotechnology, Malaysia, 4. URL2: http://www.iranicaonline.org/articles/tabriz-x-monuments -Jean Baptiste Tavernier. (Visited on 2015).